Kristine S. Trocki opened her Jamestown, Rhode Island law firm in 2006 and has been practicing law in RI for over 15 years. Dedicated to serving her clients and the local community, Kristine opened her doors not only with a strong knowledge of the law but with an equal desire to practice in a way that is creative, intelligent, and mindful, thus offering clients several approaches to addressing/fulfilling their legal needs. Kristine has applied this philosophy to her many areas of practice including: Mediation; Divorce & Family Law; Personal Injury & Auto Accidents; Wills, Healthcare & Financial Powers of Attorney; Probate; Contract & Business Law; Employment Law; Landlord/Tenant Law; Medical Malpractice; Products Liability; Wrongful Death; DUI & Criminal Defense; Collections; Real Estate; and Zoning and Land Use. Kristine earned a J.D. from Northeastern University School of Law and both an M.A. in Political Science and International Relations and a B.A. in Political Science from the University of Rhode Island. Most recently, Kristine received her Certiﬁcation as a Family & Divorce Mediator from the Roger Williams University School of Law in 2010 and is on the Rhode Island Court-Approved Mediator List. Kristine is licensed to practice in both Rhode Island and Massachusetts, and she has been admitted to the United States District Court, District of Rhode Island as well as the United States District Court, Eastern District of Wisconsin. Prior to opening her own practice, Kristine worked as an associate in the civil litigation firm of Medeiros and Sanford, and she also spent several years as a litigation associate, first at Taylor, Duane, Barton & Gilman located in Providence, RI and Boston, MA and then at Harrison Law Associates, also located in Providence. Before her career as an Attorney, Kristine acquired a great deal of experience working in a variety of legal settings, including clerking at the ﬁrms of Adler, Pollock & Sheehan and Tillinghast, Licht & Semonoff. Kristine also interned at the United States Attorneyʼs Ofﬁce in Providence Rhode Island, the Rhode Island Supreme Court, and the Rhode Island Public Defenderʼs Ofﬁce. In addition to her practice in Jamestown, Kristine is currently involved with numerous organizations and associations. A member of the Rhode Island, Massachusetts and American Bar Associations, Kristine is proud to be a member of the Rhode Island Mediators Association as she strongly believes in the power of resolving disputes between parties whenever possible without the time and ﬁnancial drains of prolonged litigation. On November 6, 2012 and again on November 4, 2014, Kristine was elected to the Jamestown Town Council after receiving the highest number of votes in both elections. Kristine was unanimously selected to be President of the Jamestown Town Council by her fellow councilors for both terms. Kristine is proud and excited to be able to serve her community in this important capacity and to bring her creative approach to town government. In March 2011, Kristine was elected to a three-year term to serve on the board of the Jamestown Chamber of Commerce, where she continues to promote the community's many wonderful small businesses. Kristine is currently the longest standing member of the Board. 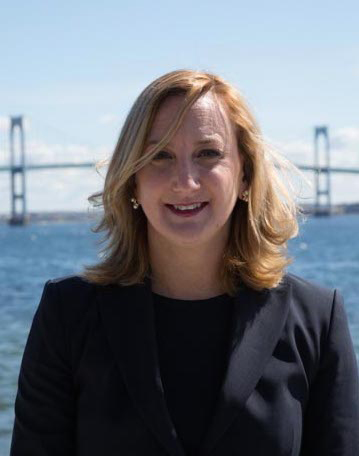 Kristine is also a member of the Newport County Chamber of Commerce, and she had served on the Board of Trustees and as PTL President of the Rocky Hill School in East Greenwich, Rhode Island. Currently, Kristine volunteers as a member of the Volunteer Lawyers Program through the Rhode Island Bar Association, and in 2011 she served as a mock trial coach for Rocky Hill School. Kristine also enjoys volunteering at the Navy's annual moot court competition on the base in Newport. She resides in Jamestown with her son, Teddy, and her yellow lab, Scout.